This NATO-spec 9mm Luger ammo from Winchester is a great choice for range practice, particularly for those using +P carry loads. The mil-spec 9mm Parabellum load is a bit hotter than your typical range ammo and will kick similarly to +P rounds. As such, it should only be used in firearms that can handle high pressure loads. 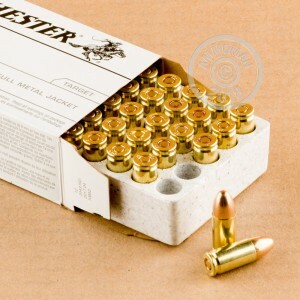 The cartridges in this case of 500 (10 boxes of 50 rounds each) use a 124 grain bullet, non-corrosive Boxer primers, and reloadable brass cases. Purchase more than $99 from AmmoMan.com and get free shipping to your doorstep. This includes most large cases. You pay only the list price, nothing more. Very pleased with this Ammo. Shoots flat and is clean.. 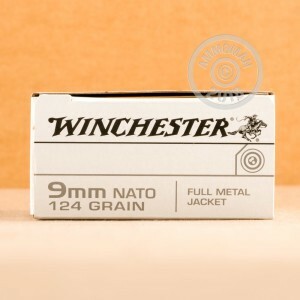 It's very difficult to find +P FMJ 9mm ammo like this for both target shooting and self-defense, This is real NATO ammo, is accurate, inexpensive, and has enough recoil so you know it is, in fact, high-velocity +P. My carry pistol is loaded with +P JHP and this NATO +P FMJ alternating them every other round. Arrived quickly as promised during holiday week. Increased bullet weight good for practice punch, and cheaper than duty ammo to training for recoil. Could have not gone any better. I ordered 500rds on sale at 2pm.And had it at 3pm next day.And it was free shipping.Instead of driving to get ammo.I thought why not order it online after all it's best price and name brand ammo and free shipping?It's a no brainer right? Fasted shipping on planet earth. Ordered on Thursday and received on Friday by 2 pm.I have ran 50rds through sig 226 & czpo9.No problems at all.good price, good ammo will order again. 10 star rating. Ordered on Friday and received it on Tuesday. I've shot white box winchester before, it runs, my pistols like it. A great range round. Even ammoman puts this on sale now and then, grab it when he does. Ran well in my Mac 11 9mm and my Sig mpx. No malfunctions at all. Decent ammo for a decent price. Fired plenty of NATO 9mm in the army. This seems a little softer shooting. Accuracy was ok, but nothing to write home about. Fired through 2 Glocks​, an hk p30, and a Beretta 92a1. 115gr wwb grouped better though all pistols. I like this ammo vs the 115 grain. never had a problem with the Winchester 115 grain but somehow this feels so much better. I always recommend ammoman to my friends. My second Ammoman purchase in as many weeks and will not be the last. Ordered on Saturday night, at my door on Tuesday.Awesome shipping at a good price! Thanks Ammoman. Excellent ammo. I recommend without reservation. This ammo worked great in all my weapons from my SMG to my P938! Shipping is always fast with AMMOMAN. Ammo was excellent. No issues whatsoever. More impressive is the service and speed of Ammoman. 124 gr NATO spec round that gives a similar recoil to +P HP ammo for training purposes. Sealed primers for long term storage and moisture resistance. Best price I've seen anywhere for this excellent ammo.